There’s a reason they call Damascus, Virginia Trail Town, USA. It’s criss crossed by the Appalachian Trail, the Virginia Creeper Trail, the Trans-America National Bicycle Trail, and the Iron Mountain Trail, just to name a few, and it lies within striking distance of hundreds of miles other multi-use recreational thoroughfares. The town is so steeped in trail culture that it hosts a yearly celebration of the Appalachian Trail. Trail Days draws tens of thousands of people every year and is known as the world’s largest backpacking event. Damascus lends itself to weekend adventurers throughout the warmer months. Check out this Blue Ridge Outdoors guide to Damascus from their archives. It was the first in a bi-monthly guide series they call 48 Hours. When you roll into Damascus consider setting up a base camp at the Damascus Old Mill Inn. This historic twelve-room inn is situated on the banks of Laurel Creek not far from the Virginia Creeper Trail. 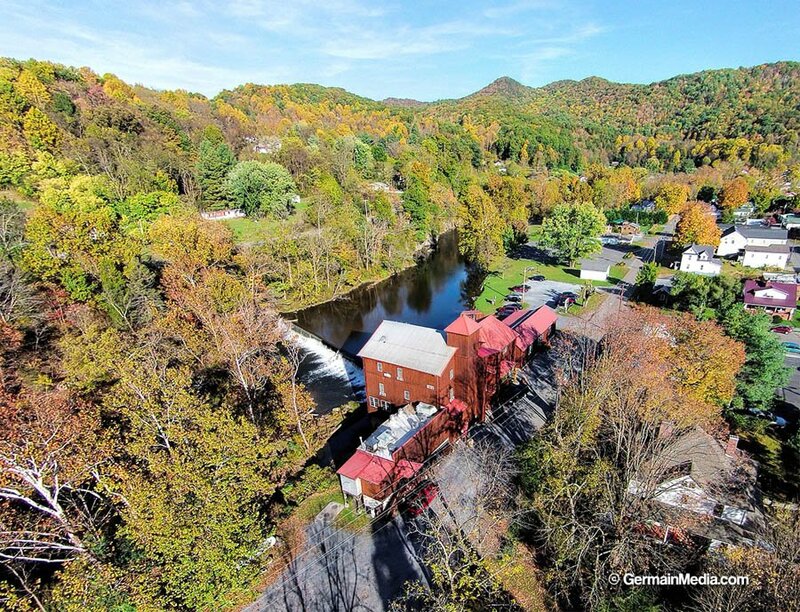 The Damascus Inn has a restaurant and pub, overlooks the grist mill waterfall, and sits in the heart of downtown. If you want to disappear for awhile in the Virginia backcountry, consider this 10-mile loop in the Grayson Highlands. Appalachian Trail speed record-setter Jennifer Pharr Davis calls this one of her most soul-satifying hikes, and its easy to see why. 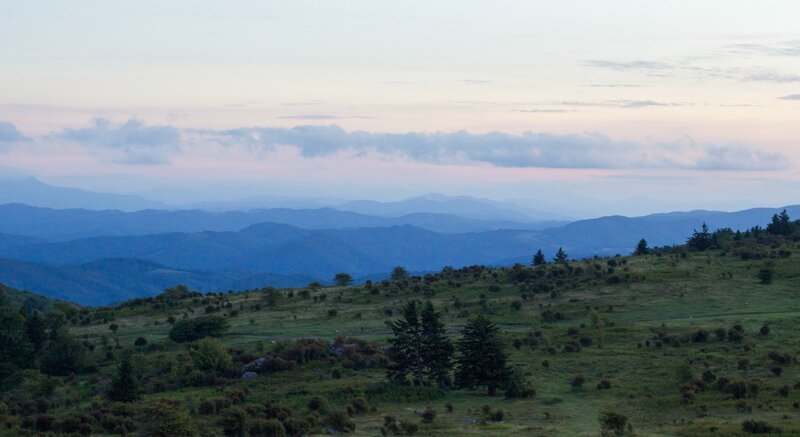 Grayson Highlands is an area known for big sky, impressive vistas, and wild ponies. From Damascus, take VA 58 16.4 miles west to a left on Grayson Highlands Lane. Once there you’ll want a good map to link the Horse Trail East to Wilson Creek, the Appalachian Trail, the Appalachian Spur trail, and the Cabin Creek Trail for a perfect 10 miler in the Virginia Highlands. If you plan to tote the fly rod into Damascus, you don’t want to pass up the opportunity to fish at Whitetop Laurel in the Mount Rogers National Recreation Area. Commonly touted as Virginia’s finest trout stream, Whitetop Laurel is fishing best from April to June, but May and June are the prime months. There are two sections of Whitetop Laurel that are specially regulated for wild trout only. Above and below the regulated sections are stocked trout areas. Check out the VC Flyshop for more info. The Damascus Brewery is small but mighty. Owner Adam Woodson cranks outs 34 different brews that he rotates through 8 taps. The beers range from a classic IPA and porter to an apricot hefferweizen and a butterfly Belgian pale ale. The brewery is open Thursday, Friday, and Saturday, and live music is featured once a week. Check out the website for more info. The Mountains of Music Homecoming is a nine-day celebration of the communities in Southwest Virginia – their heritage music, cultural assets, and outdoor amenities. This event will be held June 9 – 17, 2017 and feature Crooked Road concerts in more than 30 communities throughout southwest Virginia. Click here to learn more. The Woodchuck Hostel is another good spot, especially for those hoping to save a few bucks. This hostel is run by the ever hospitable Chuck Bissonnette. Chuck charges $10 a night for tent camping, which includes bathroom and shower amenities as well as use of the kitchen and outdoor grill. For $25 you’ll get a bed with a memory foam mattress, and five bucks gets you one load of laundry. Dogs are always welcome. The Woodchuck Hostel is also conveniently located next to the Damascus Brewery and is a only 200 yards from the A.T. The South Fork of the Holston is a great option for whitewater kayakers. With class II and III rapids, the South Fork of the Holston offers several good put-ins close to Damascus. Two of the most popular are at the Old Mill and Drowning Ford. The minimum flow for running Drowning Ford, without tearing up your boat too much, is about 350 cfs. To put on at the Old Mill you’ll need flows closer to 800 cfs. Click here for more info. The Virginia Creeper Trail is 35 mile rail to trail system that runs from Whitetop to Abingdon, Virginia. 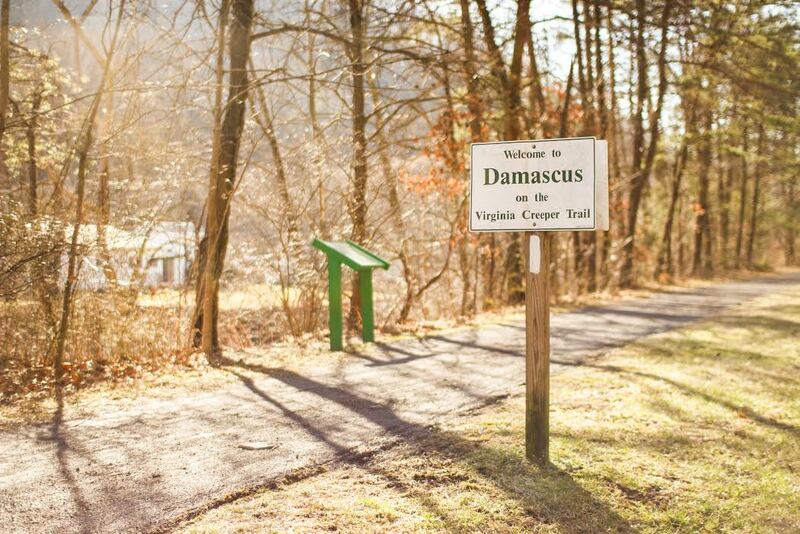 Damascus is one of the best places to access the Creeper, and one of the most popular nearby sections is a 17-mile downhill ride from the top of Whitetop Station straight into town. Contact Adventure Damascus for shuttle and bike rental services. There is a great MTB designated section of the Iron Mountain Trail that used to be part of the original A.T. up until 1972. To access this start at Hurricane Mountain at FR 4022 near VA 741. 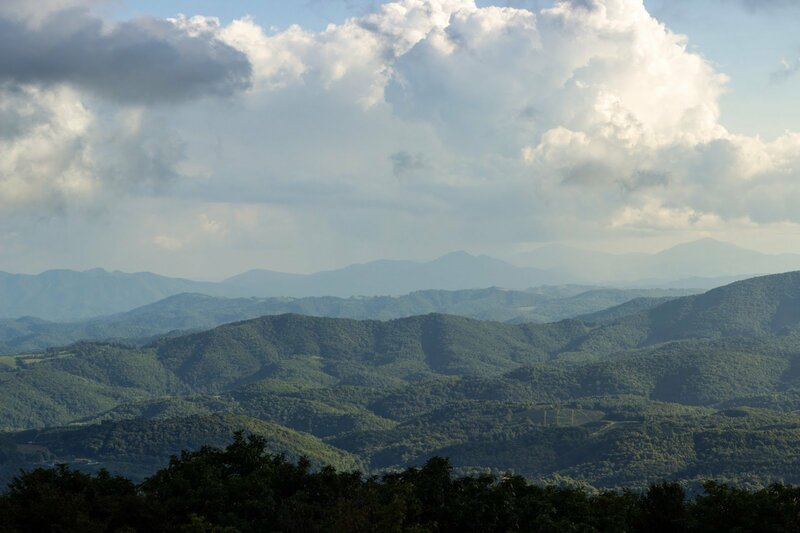 It traverses over 20 miles of rocky ridgelines, scenic vistas, and oak forests straight into Damascus. This trail has its share of technical single track, and a Trails Illustrated Mount Rogers NRA Map (#786) is recommended. Click here fore more info. Mojo’s Trailside Coffeehouse is a Damascus staple. Situated at the intersection of the A.T. and the Virginia Creeper, this thru-hiker hub is the only cafe with free wifi. Mojo’s is known for it’s great coffee and breakfast specials. Hey Joe’s is the place to go for fish tacos and friendly service. It’s a favorite of hungry Creeper Trail devotees and offers gluten free and vegetarian options. Pepper Schutte works at Sun Dog Outfitter, the sister store of Adventure Damascus. He says Grayson Highlands is what stands out most for him when it comes to outdoor adventure in Damascus. These days Dennett Dwyer calls Brevard, North Carolina home, but he lived in Damascus for 12 years. Here’s what Dennett has to say about Trail Town, USA. Originally written by Blue Ridge Outdoors. Featured image provided by Germain Media.